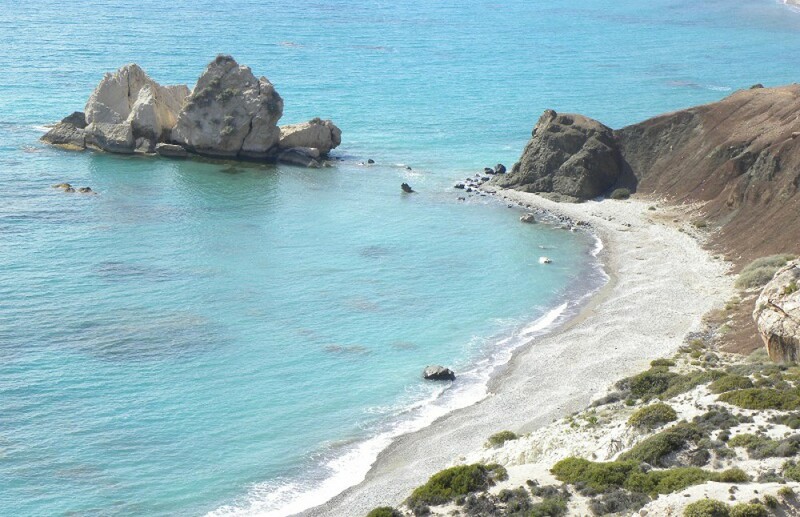 Cyprus is a small island situated in the eastern Mediterranean. It is a democratic nation-state with an ancient and historic cultural heritage. Saint Paul’s missionary journeys began in Cyprus, in Paphos his preaching converted the Roman governor Sergus Paulus to Christianity (Acts 13) when Cyprus became the first Christian governed state and the birthplace of the modern church. Cyprus’s strategic location in the Eastern Mediterranean, situated between the crossroads of three continents, had brought to the island too many conquerors over the years. The earliest human presence in Cyprus dating to the 10th millennium BC was found in a natural cave located at the southeast end Aetokremmos Cape. The site is important because it attests the existenceof human presence on Cyprus before the Neolithic era. Aceramic Neolithic archaeological site of Shillourokampos. This era is known for the oldest settlements which could have come from Greek Asia Minor. They built civilization along the coasts and stone vessels at first which was followed by pottery. Neolithic archaeological site of Choirokoitia. This era is the transitional period between the Stone Age and the Bronze Age. This is where Copper has been discovered and is being exploited on a small scale. The most important centres at this point were Erimi and Lemba. This era is known for Cyprus being rich in copper. Trades on this island have begun with Egypt, Near East and the Aegean which know Cyprus as Alasia. Around 1400 BC the Mycenaeans arrived from Greece to explore new lands. By 1200 BC Achaean Greeks have arrived bringing with them the Greek Language and Greek Mythology. Eventually they established the first kingdoms of Pafos, Kourion, Kition, and Salamis. Kition is the oldest kingdom in Cyprus being the first built. This is just the beginning of Greek civilization. There are now ten city kingdoms in Cyprus which has become a Greek island. The new kingdoms are Amathous, Lapithos, Ledra, Idalion, Tamassos and Kythrea. Phoenicians start settling in Kition bringing their own civilisation. This era is known for the first conquerors of Cyprus. The Assyrians moved in and conquered Cyprus for130 years. Pharaoh Amasis of Egypt rules Cyprus for 25 years. The most powerful leader at this time known as King Cyrus of Persia then ruled Cyprus for 200 years. The Persian Empire was the biggest the known world had yet seen. The Greek kingdoms of Cyprus welcome Alexander the Great of Macedonia. Cyprus again is part of the Greek world. In this era rivalries began between Alexander’s generals before and after his death. After Alexander’s death his generals split his empire in four parts after the many wars they had. Alexander’s third powerful general was called Ptolemy and he became a leader of one of the four parts of Alexander’s empire. This part was Egypt, Cyprus southern Turkey and a part of the Holy Land as we know today. It became the Ptolemaic Kingdom and Alexandria became the capital. The Ptolemies abolished the kingdoms in Cyprus and Paphos became the new capital of a reunified island. Despite Alexander’s death the Greeks of Cyprus still had no problems being ruled by Ptolemy because they still remained in the Greek world and Ptolemy was just as good as a leader as Alexander. This era brings the Roman conquest to the Middle East. They have already conquered Greece and Asia Minor and the Ptolemy kingdom is at its end with Cleopatra being the last queen. During this period Jesus came to existents then was crucified. His apostles sent Paul to Cyprus and met Barnaba which was a Cypriot Jew and he toured the island with him to Paphos. At this point Barnaba converted to Christianity and became the first Archbishop of Cyprus. Cyprus became one of the first countries in the world to become Christian. During the first century b.C. and the first century A.D. major earthquakes destroy the island and its cities are rebuilt. This era brings the Roman Empire to division in two parts. Christianity becomes the official religion in different ways. The Holy Roman Empire which was Western Europe became Catholics with Rome as their capital and roman as their language. Byzantium is Eastern Europe with Constantinople as its capital. The difference here was the Byzantines were Romans that used the Greek language and became Greek orthodox which again brought some Greek culture back to Cyprus which was part of Byzantium. The Byzantines built churches, castles and Empress Helena came and founds the Stavrovouni Monastery. After earthquakes destroyed the main cities Constantia became the new capital of Cyprus. Cyprus at this point would follow 800 years of rule. During this rule in 650 AD the Arabs celebrating their new religion attacked Cyprus numerous times on the coasts which resulted in Lefkosia in the centre of the island becoming the new capital. Isaac Comnenus self proclaimed the island independent from the falling Byzantine Empire. Part of Richards’s fleet washed up on the shores of Limassol and he takes them all prisoners. Richard who was on his way to the third crusade stopped at Cyprus and fought against Isaac for revenge. After a few wars and the sieges at castles Richard becomes the new leader of Cyprus which means that the British have had influences in Cyprus back then. He married his fiancé Berengaria which resulted in the first Royal Wedding in Cyprus by the British. After the third crusade Richard has no need for the Island and he sells it for 100,000 dinars to the Templers. There was a big revolt between the Greeks and the Templers for the reason that the Templers rose taxes. This forced them to resell it to Guy de Lusignan who was a French crusader and deposed king of Jerusalem by Saladin. This era brings the Catholic religion to Cyprus which manages to survive. The Greeks thought it was better then being conquered by the Arabs. The Lusignan brought wealth to the island building cathedrals and palaces in Lefkosia and Ammochostos. Building defensive walls around the Ammochostos city and Ammochostos became the richest city in the Middle East. This is where these cities are referred to as Nicosia known as Lefkosia and Famagusta known as Ammochostos which were the most important cities in Cyprus. The last Queen of Cyprus was Catherine Cornaro who cedes Cyprus to Venice. This era brought many Venetian military architect to Cyprus to fight the growing Ottoman Empire. The Venetians fortified castles and walls and built a new wall around Lefkosia (Nicosia). They used Cyprus as a shipping port mainly but they were also Catholics which didn’t cause any concern with the Greeks. They brought wealth to many areas like the Lusignans did before them. They already had a naval war with the Byzantines and now they have got one with the Ottomans which resulted in the fall of Venice from Cyprus. This era brought the Ottomans to Cyprus which was one of the most hated conquerors by the Greeks since Greece and Ottoman were at war. The main battles were at Lefkosia (Nicosia) and Ammochostos (Famagusta). When the Ottomans became rulers they plunged the country into oblivion. They converted cathedrals to mosques and slaughtered many Greeks. Eventually the archbishop became the Greek representative to the sultan. Ammochostos (Famagusta) which was the richest city in the Middle East became nothing more than a city of dust. In 1821 when the Greeks moved the Ottomans out of Greece the Ottomans slaughtered more Greeks in Cyprus who supported it. This era brought back the British from the King Richard Days and a joy for the Greeks which gave them more freedom and Christianity. Cyprus was still part of the Ottoman Empire but was actually being leased to the British on the condition that they supported them against the growing Russian navy power. This carried on until WW1 when Ottoman came into the war on the side of the central powers. This made Britain annex Cyprus and was now part of the British Empire. In 1923 the Ottomans relinquished all claims of the island with a treaty and in 1925 Cyprus became a crown colony. In WW2 Cyprus saw little action but the Greek volunteers were taken by the British to the action. During this period the Greeks saw themselves as Cypriots more than Greeks. After the war Britain brought technology to the island such as cars, telephones, roads, and proper houses which took Cyprus back to wealth but on limits. In 1955 the Greeks thought it was time to unify with their long time allies, the Greeks in Greece. The problem was the Turkish Cypriots from the Ottoman days which were only a community now didn’t like the idea mainly because they saw it as going from one ruler to a worse one. The British also didn’t like the idea of loosing their vital base in the Eastern Mediterranean mainly because of the cold war with Russia. With the Agreement of all sides Cyprus was given independence to satisfy Turkey, US and the UK but not the Greek Cypriots. The Zurich-London Agreement makes Cyprus an independent island on the 16th August 1960 with Cypriot as the nationality and Greek and Turkish as the languages of the two communities. Cyprus becomes part of the Non-Aligned Movement, the Commonwealth and United Nations. 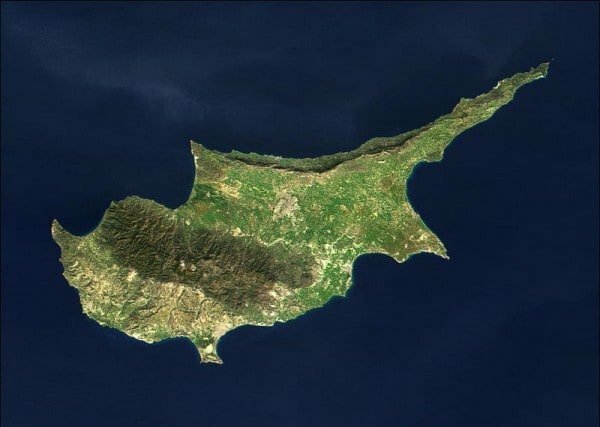 With the agreement Britain keeps two military bases on the island for military interests and Turkey, Greece along with Britain are guarantor powers of Cyprus. The 1960 constitution was unworkable so in 1963 President Makarios made attempts to change it but the Vice President Kucuk disagreed and so conflict spilled between the two communities in gun battles. This created a civil war between the two Cypriot communities from 1964 until 1974. Official Independence Day is celebrated on 1st October. On July the 15th the military government in Greece staged a coup against Makarios who at this point was against enosis due to the fact that he despised the military government. This created a window for the Turkish army to invade to do their long time objective, Partition. On the 23rd of July the Greek military government fell and democracy was restored in Greece along with Cyprus. Clerides a long time Cypriot politician assumed the role of president until Makarios returns. This did not stop the Turkish army which staged another invasion on the 14th of August. This divided the island into North and South with the Turkish army occupying 37% of the island. Cyprus suffered economic depression, human rights disasters and refugee crisis. By the end of the 70s the country started to pick up again and many problems were being taken care of. Many problems like refugees and property rights have been left until now. In 2004 Cyprus became part of the European Union which has brought a lot of international infrastructure to the island. There is hope that Cyprus will eventually become a peaceful reunified island after being conquered for over 2500 years. Περί Κύπρου (About Cyprus) pgs 42 – 50 Published for the Cyprus Government, Press & Information Office, P.I.O. 316/2009 – 8.000, by Aristos Philis Printers Ltd. This information is just in brief so that you can get a good idea of not just the island but the area. You can find more information, as well as lots of pictures in an e-brochure published by the Cyprus Tourism Organisation called Cyprus: 10000 years of history and civilisation, pgs 5 to 14. Detailed information: Timeline of Cypriot History. Για την ιστορία της Κύπρου στα Ελληνικά μπορείτε να διαβάσετε εδώ. Now you can understand better why Cyprus cuisine has evolved into an amalgamation of diverse tastes and textures. We see influences from the Ottomans and its neighbouring Middle Eastern countries but there are also remnants of French, Italian, and Anglo-Saxon influences stemming from the island’s occupation by the respective conquerors. Cyprus’s strategic location in the Eastern Mediterranean, situated between the crossroads of three continents, had brought to the island many conquerors and thus its cuisine has evolved into an amalgamation of diverse tastes and textures, with an unmistakable mark that makes it undeniably Cypriot. We see influences from the Ottomans and its neighbouring Middle Eastern countries but there are also remnants of French, Italian, and Anglo-Saxon influences stemming from the island’s occupation by the French Lusignans, the Venetians, the Ottomans and the British. Vegetables: Some of the fresh ingredients used in Cypriot cuisine are those used in almost all Mediterranean countries, such as cauliflower, courgettes, green beans, okra, peas, eggplants, artichokes, carrots, radishes, parsnips, broad beans, tomatoes, cucumbers, cabbage, lettuce, mushrooms, agrelia (wild asparagus) and other wild greens, etc. A root vegetable which is not used in other Mediterranean countries is kolokassi (taro). Dried legumes: white beans, broad beans, brown lentils, louvana (Cyprus vetch – lathyrus ochrus), chickpeas and black-eyed beans. Herbs & Spices: The most common herbs and spices of the island are parsley, MINT, oregano, thyme, celery, coriander, rocket, black pepper, CINNAMON, cumin (artishia), etc. Cypriots are Orthodox by religion and for Orthodox faithful almost half of the year is fasting period. Meat, including fish with backbones and all the animal products, are not permitted, so our “nistisima”, as they are called, are all vegan. All molluscs, like kalamari, octopus, shrimps, mussels, etc., as well as honey, gelatin and fish roe are allowed during fasting. Meat dishes: These include lamb pork, poultry, beef or veal, fish, seafood and game. Some of its most popular dishes are souvla, souvlakia, sheftalia, ofton kleftiko, ttavas, koupepia, keftedes, makaronia tou fournou, moussakas, afelia, etc. Cheeses: Halloumi, kaskavalli, graviera, Pafitiko, kefalotyri, anari. Charcuterie: Sausages, lountza, posyrti, pastourmas, tsamarella, chiromeri, apohti and preserved meat. Mezes, plural mezedes, are small appetizer plates which should not be considered just as starters, as Cypriot mezedes are more than that. Mezedes are a meal on its own, where people gather to eat and enjoy some drinks. Mezedes include a large selection of both appetizers and main dishes which are served in small helpings and sometimes mezedes can include up to 30 different dishes. Because of the wide variety of mezedes, you can get fish mezedes, meat mezedes or mixed mezedes (which include both fish and meat) as well as vegan and vegetarian mezedes. Some mezedes are common in both meat or fish mezedes and as soon as you order they will start bringing the cold appetizers, four or five dishes each time, ending with hot dishes, mostly grilled. Drinks: Wine, beer, zivania, brandy. Wines, including the most ancient dessert wine in production, which is Commandaria. A popular drink in Cyprus is Brandy Sour. 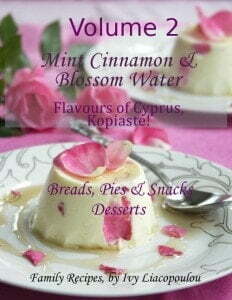 Finally the desserts are mainly flavoured with vanilla (imported), BLOSSOM WATER, rose water, CINNAMON and mastic resin. You will find most all these dishes in the cookbook as well as many more. I have included a small variety of photos which will introduce you to these and many more Cypriot dishes. Order your hard copy now! 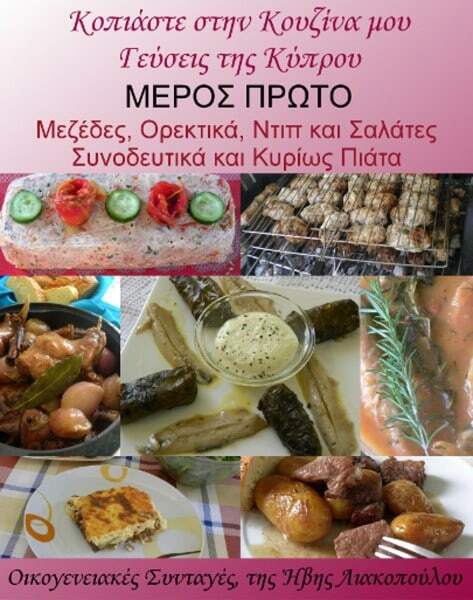 Volume 1 of my e-cookbook in Greek in pdf format / Ο πρώτο Τόμος του βιβλίου μου στα Ελληνικά σε μορφή pdf. For more details about my cookbook read here. / Για περισσότερες πληροφορίες διαβάστε εδώ. I recently purchased Ivy’s recipe book “Mint Cinnamon and Blossom Water” and can say it was worth every cent. Amazon took a few extra weeks to deliver, however, it was worth the wait! Thank you Ellen for buying my cookbook and for your kind words. Hope you enjoy it.